Many people wonder if art lessons for autistic students can help their children. Find out about the many developmental benefits art lessons bring to children with autism. Some people believe that while art lessons do no harm, they don't really do any good for people with autism. Other people claim that using art therapy for autistic students improves their functioning level and overall quality of life. 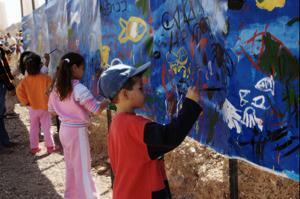 Check out some of the possible benefits your child can gain from an education in art. Finding a good teacher or therapist isn't hard if you know where to look. Call your local resource agency, hospital, or doctor's office to find candidates for the interview process. If you're unsure about what qualities a successful art teacher possesses, make a checklist that includes topics like the ones in the examples below. What is her educational background and training, especially in the area of teaching kids with disabilities? What is his real world experience working with autistic students? How is her syllabus or lesson plan formulated? What is a typical lesson or class like? How does he define his approach to learning and individualism? How does she define art's place in the life of an autistic child? If you think that art lessons for autistic students have a place in your child's life, do your own due diligence and make sure it's right for your family. While it's proven that art lessons are beneficial to people with autism, it's important not to force your child into anything he isn't interested in. Look at the links below for more autism art advice.